Fans of the hit HBO series Game of Thrones can now rejoice thanks to the Game of Thrones House Sigil Wine Stopper 6-Pack. The sigils in this set are duplicated from the same digital assets used to create the actual map marker props during the production of the Game of Thrones series. The Game of Thrones House Sigil Wine Stopper 6-Pack features wine stoppers representing the houses of Frey, Greyjoy, Karstark, Lannister, Stark, and Tyrell. 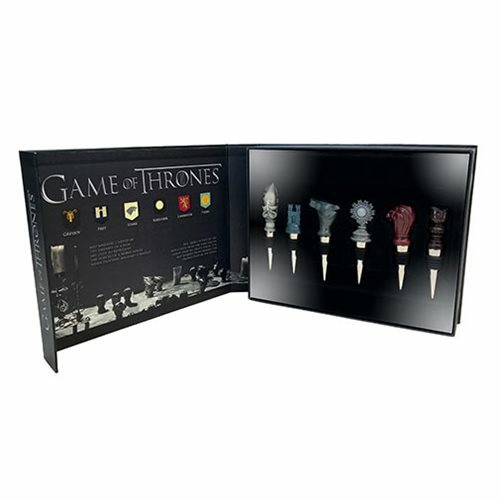 The Game of Thrones House Sigil Wine Stopper 6-Pack comes in a beautiful presentation gift box. Ages 21 and up.